On June 24th the Federal Trade Commission’s Bureau of Consumer Protection sent several dozen strongly-worded letters to Internet search engines. Those letters served as a warning: clearly and prominently distinguish paid advertising from natural results or you may find yourselves in violation of Section 5 of the FTC Act, which prohibits unfair or deceptive trade practices. The rationale the FTC gave was equally straightforward: since the agency’s original guidance letters were distributed to search engines back in 2002, there has been a noticeable decline in the level of voluntary compliance. The letters come on the heels of the FTC’s April release of its updated .com Disclosure Guidelines, and can be seen as yet another signal of the agency’s renewed commitment to maintaining order in a rapidly evolving online environment. The basis for its interest in search engines specifically is a series of recent studies indicating that there’s now considerable consumer confusion surrounding search engine results. 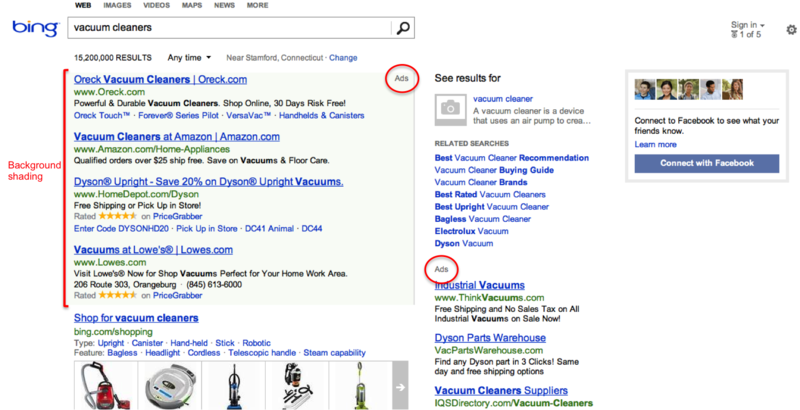 Specifically, the distinction between sponsored links and organic search results is becoming increasingly blurred. For example, a recent Pew Research Center Survey found that 62% of searchers surveyed were not aware of the distinction between paid and non-paid results. And because search ranking based on payment (as opposed to relevance) is a form of advertising, it falls squarely within the jurisdiction of the FTC. While acknowledging that there is no one right way to present sponsored search results, the FTC cites two practices in particular that are leading to consumer confusion. The first is background shading of sponsored links that does not contrast well with the overall background of the page, and therefore does not clearly distinguish between types of results. It recommends more prominent shading and/or borders around sponsored results to reduce confusion. The second is the use of text labels that insufficiently identify sponsored links. It notes that in recent years these textual notices have become significantly smaller, and have migrated away from the links themselves and toward the upper right hand corners of pages—rendering them much less conspicuous. It suggests using text labels that explicitly and unambiguously convey the type of search result a viewer is looking at, and that are both large enough and close enough to the search results they qualify to clearly relate back to them. As it has done before, the FTC noted that it recognizes the business of search engines will change as consumer search demands shift, and that disclosure techniques will also evolve. But it emphasized that advertising disclosures must keep pace with innovations in how and where search engines deliver information to consumers. 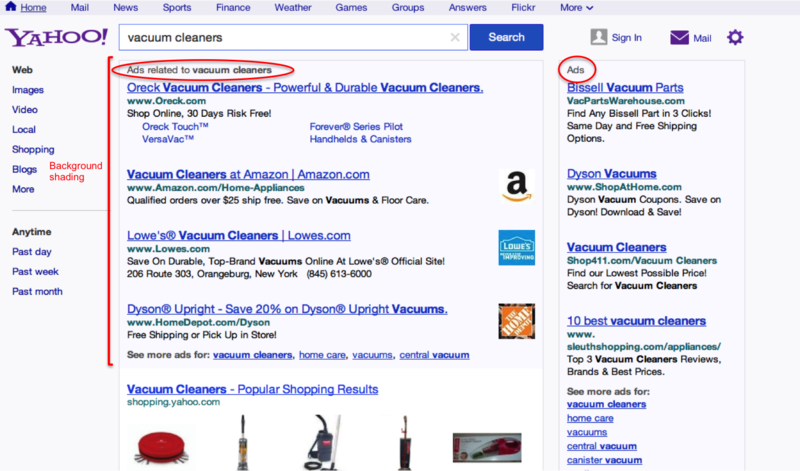 Here’s a sample of the search results from the top three U.S. search engines, using the keywords “vacuum cleaners.” Do you think the distinction between sponsored and organic search results is clear and conspicuous? Tell us what you think.